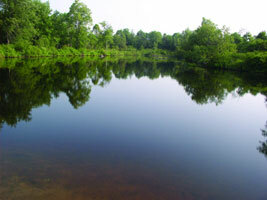 Please visit this website for more complete information on the Refuge. Our mission is to give shelter, warmth and hope in face of poverty and need. Together, we create a home in the countryside where women, men, single parents, children, and any in need can experience safety, community, and belonging in the process of regaining strength and building healthy lives. Rooted in the prayer of the Christian church, we respect the beliefs and faith of all who come. The purpose of this house is to be a "home away from home" for people who need a break: peace and quiet, shared meals and work, nature, fresh air, prayer space.The Refuge is about people who share this dream of communion with the poor, with Christ, and with one another, in the most concrete ways: doing dishes, sweeping floors, sharing tasks, meals, and life’s events. The St Mary of Egypt Refuge is administered by a Board of Directors and is under the spiritual guidance of Archbishop Seraphim (Storheim) (Archbishop of Ottawa and Canada, Orthodox Church in America) and Archbishop Brendan O'Brien (Roman Catholic Archdiocese of Kingston). We are a not-for-profit corporation and a registered charity in Canada. Our Refuge was opened on July 19, 2004. 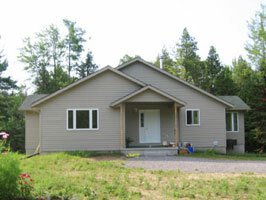 The new house was officially opened on May 5, 2007. 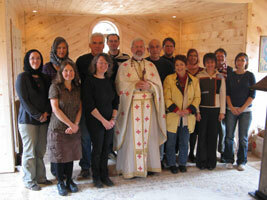 Our new chapel was inaugurated on October 23, 2009. • Six bedrooms, three bathrooms and two gathering spaces. There is lots of room for tents, barbecues, playing, planting, just being. Also a beach (swimming), with picnic area and a gazebo. 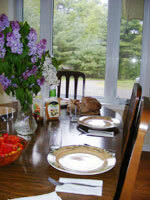 265 acres, rolling hills, woods and meadows - pine, spruce, cedar, birch, maple. 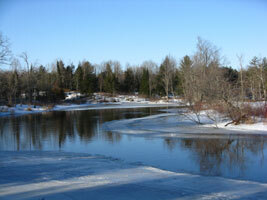 The Black River, with ponds and rapids, cuts through the land behind the refuge. There is a chapel space in the house and in the woods. 206 Barry Road, Queensborough, Ontario, Canada. 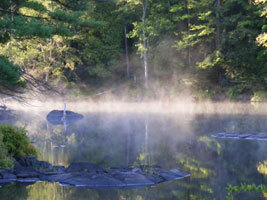 20 minutes from Tweed or Madoc. 1 1/2 hours from Kingston. 2 1/2 hours from Toronto or Ottawa. Highway 401 east to Belleville exit 544. Highway 37 north 44 kms. through Roslin, Tweed and Actinolite. Turn west (left) on Highway 7 for 2.7 kms. Turn north (right) on Queensborough Road for 9 kms to Queensborough. In Queensborough, turn north (right) on Barry Road for 1.1 kms to 206 Barry Road (on the right - St Mary of Egypt sign). Highway 7 west (towards Peterborough) to Actinolite. From the junction of Highway 37, continue west on Highway 7 for 2.7 kms. The Refuge has its own activities, and is also available for use by appropriate external organisations. Preference is given to charitable groups, Christian faith groups, people working with those in serious need, groups working with families. Priority is given to women, children and men who are in financial or other difficulty. 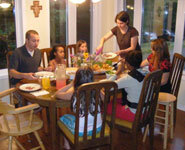 Special rates for groups which serve the needy. During the first full weekend of every month, individuals, couples or small groups are welcome to spend the weekend with us. We ask $100 per person (negotiable), and will ask you to share in the work and life of the Refuge; you may choose whether to spend free time alone or with others. 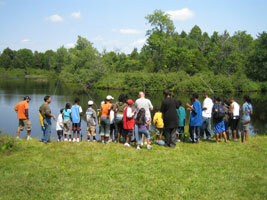 Participation is by referral for those who have not yet been at the Refuge. Family and individual counselling available. 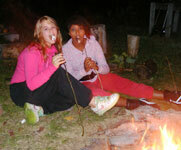 Retreats are open to people from all walks of life; no one is excluded because of gender, economics, religion. We have worked with city after-school programs, church groups, single mothers, adults with developmental disabilities, and art therapy groups, among others. Emphasis is on welcoming those who come from a socially disadvantaged position, and for whom this kind of opportunity has mostly been denied. St Maria of Paris Retreat, February 2009. The goal is to bring people to a deeper sense of connections with themselves and the environment, and possibly healing. For city people, it means time with nature, silence and simplicity. For rural people, it provides a resource for people who are isolated, and may not have access to social services. We provide a place for people to gather and to have for their difficulties a larger community of support, with a circle of care that may be harder to get in a rural setting. All are welcome, by referral if we have not already met you. No one is refused space on the basis of finances. Normal rate: $250 per day. Reduced rates may be possible. Minimum rate: $100 per day. Tax receipts given for donations. Partial listing - see the Saint Mary of Egypt Refuge website (www.stmarysrefuge.org) for more up-to-date information on current activities. First full weekend of every month - see above. March 25-27, 2011 : Spirituality of the Laity. Retreat led by Dr Paul Ladouceur. We will reflect on the spirituality of the laity in Orthodoxy, drawing the writings of Paul Evdokimov, a modern theologian who focussed creatively on Christian life “in the world," as our main source. This retreat will provide a community environment, with shared meals, prayer in the Orthodox tradition, input by the retreat leader, time for reflection and discussion. At the Refuge, participants share in some household tasks (such as doing dishes), which is part of the community life during our time together. Accommodations include shared bedrooms and bathrooms. Cost: $150. Poster (pdf). July 3-16, 2011 : Intensive Summer Course: Fundamentals of Orthodox Spirituality (1st to 14th Centuries). Instructor: Dr. Paul Ladouceur. In the context of Orthodox/Eastern Christian Studies, a unique opportunity to study Orthodox spirituality in a rustic pastoral and prayerful setting. Live theology with your mind, heart, and body in a context of community living. This twelve-day residential course may be taken for credit or audited. 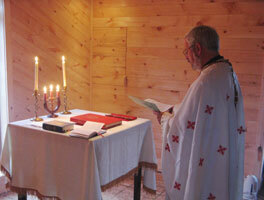 Morning and evening prayer in the Orthodox tradition will be part of the learning experience. Poster (pdf). Additional information (pdf). 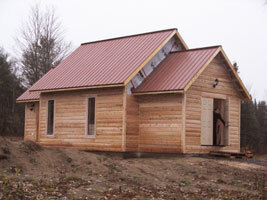 For additional information on activities at the St Mary of Egypt Refuge, visit the Refuge website. Receive our Newsletter and become part of our Extended Family. One-time specific donations to assist with particular needs. Our day-to-day expenses are funded by a small but dedicated donor base, which has been able to cover mortgage, taxes, and utilities. Grants have enabled us to rebuild the house, to build a chapel, and to make the place more child-friendly, with a dock for fishing and swimming, a screened gazebo, and a children’s playground. 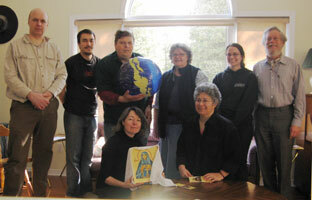 People who come on the retreats contribute what they can. Many in-kind donations have kept us able to provide high-quality programs. Saint Mary of Egypt lived in the sixth century. A woman who ran away from her family and lived by seducing men, she was isolated, addicted and starving without even realizing it. One day she found healing through the presence of the Mother of God and the invitation to come into God’s Church. After living 50 years in the desert, she was met by a monk who wanted to know what holiness looked like: he was led to Mary. She has blessed this Refuge with her patronage; she teaches us that the Church is the place in which the broken and outcast are loved and honoured and become whole. "Blessed is God Who creates the great and wondrous, the glorious and marvellous without end " (from the Life of Mary of Egypt). Read the full Life of Mary of Egypt by St Sophronius of Jerusalem (6th century). In 2001, having experienced first-hand some ways in which the life of poverty, Eucharist, and family have taken flesh both in Toronto and in other parts of the country and the world, Mary Marrocco received the blessing of Pascal Pingault to begin a new community life. Accompanied by others who encouraged her in her dream, she established a charitable organization which began a search for a generous, beautiful acreage which could become a refuge for those in need. 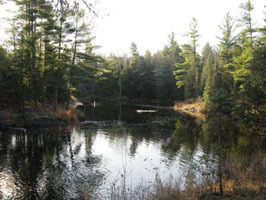 After three years of intensive search and prayer, supported by donors both financial and spiritual, the property was found and purchased in July 2004: 260 acres of woods, trees, peace and beauty, with the Black River running through it. 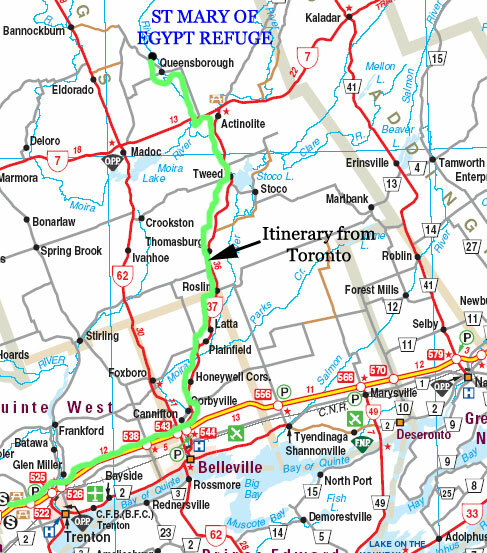 Situated about halfway between Toronto and Ottawa, just north of the Trans-Canada highway, it is meant to be an inn like that to which the Good Samaritan took his injured friend, a place of life and work, refuge and healing. Part of the experience of St Mary of Egypt is to see the connection between conservation and recycling, proper eating, exercise, fresh air, healthy foods, and the environment—and to see that these things all improve one’s personal health and life quality. Participants really work with the land; they have planted, weeded, raked and reaped. Our goal is to have a greenhouse to grow some of our own food and help educate children and adults about the organic growing of food. We also plan to keep our undeveloped land as a sanctuary, where children and adults can learn about local flora and fauna and the natural life cycle. St Silouane the Athonite Retreat, October 2009. To receive our newsletter, please write, email or telephone us with your name and address. To receive electronic mailings, please send your email address. 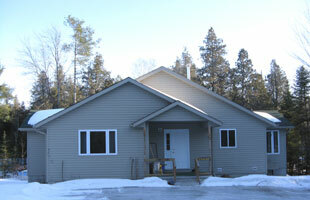 "Fire & wind: building a refuge that belongs to Christ"
Most recent update : 17-02-11.